Alien Explorations: Giger's "Pump Excursion"
Pump Excursion was completed by 1988. It shows a suicide with a man who is about to blow his head off with a pump-action shot gun in his mouth, but the way he holds the weapon is very delicate and particular. 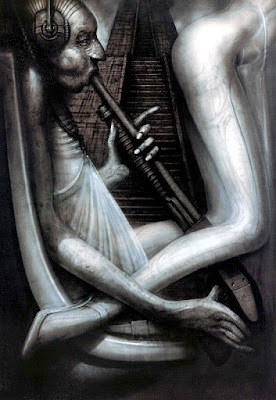 Perhaps the imagery was inspired by Giger, Giger owned a gun as the one shown in the painting, but the gun is not built to be held in the way it is seen here. However it is also like a flute to make music. 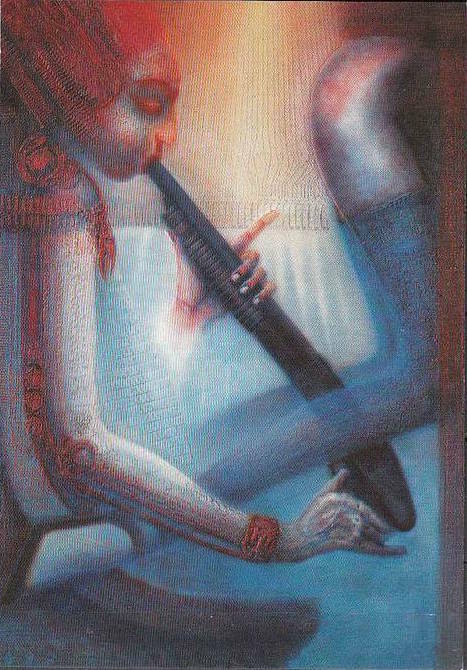 Giger wanted people to think at first that this was an American Indian who is playing an instrument. In the background is a pyramid based on ancient South American culture, either Aztec or Mayan. Another way that Giger related to this was the fact that he liked to play a certain type of wild saxophone as a fan of Jazz music. The character wears ear protectors as a kind of joke, so that he doesn't hurt his ears when he shoots. Perhaps one could imagine them as headphones so he could listen to music, and so again he doesn't want to damage his ears. He did this painting four times, twice in black and white and twice in color. The color versions are different in textured relief. Since then he only used the airbrush a few times on lithographs, but he did this in the old manner in which he worked between 1966 and 1969 on his Atomic Children, that could be said to be cyberpunks wearing virtual reality headpieces. He would spray on transparent paper which is used by architects, and then he would scratch away at it with a razor blade. He also used a paper with a special coating that's a little stronger. He could scratch away at it six or seven times without making a hole in it. Giger: Of the Fool, Pump Excursion—yeah I did four versions of it, and they were some of the latest things I did. After that I stopped painting—or nearly stopped—I had to finish some things but not much. I think the last painting I did was the work on Species. J Karli: So the thing is when I looked at this, and I was reminded of this when you mentioned mushrooms, but the date I had on this was wrong—it’s 1988 right? Giger: Pump Excursion is about ’87. Giger: It’s to blow away his head. J Karli: But is the attitude of his hands significant, he holds the weapon in a very delicate and particular way. Giger: Yeah, yeah—I mean the gun is not built to hold it like that. J Karli: When I first looked at this I thought it looked like a bong. J Karli: Do you know what a bong is? J Karli: A water pipe. J Karli: For smoking marijuana. 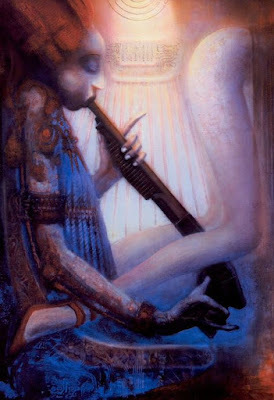 Giger: Yeah, it was like a flute, like an instrument to play. J Karli: His cheeks are puffed out. Giger: Yeah, to make music. I wanted people to think at first that it is an Indian who plays an instrument. J Karli: Do you mean from India—or an American Indian? J Karli: So this pyramid in the back is Mayan or Aztec or something? J Karli: There’s again a symmetry in this Fool image, a cross at the bottom, a St. Andrew’s cross, several crossing elements. Giger: Crosses in this painting? I don’t remember. J Karli: Well, the arm and her leg form an "x" at the bottom, and the shotgun and his hand form an upward cross—which matches the pyramid rising up as well. J Karli: So that was not intentional? J Karli: You do a lot of interesting things accidentally. Giger:Yeah, it looks like it. Well, what I wanted to do with that painting was show that in the end he would be looking at the last thing he saw when he was born—where he was coming from was his last view. J Karli: Are those headphones on his head? Giger: What they are—it’s a kind of joke, they are ear protectors—so he doesn’t hurt his ears when he shoots. J Karli: Right. That’s a little subtle. I thought you had him listening to music. 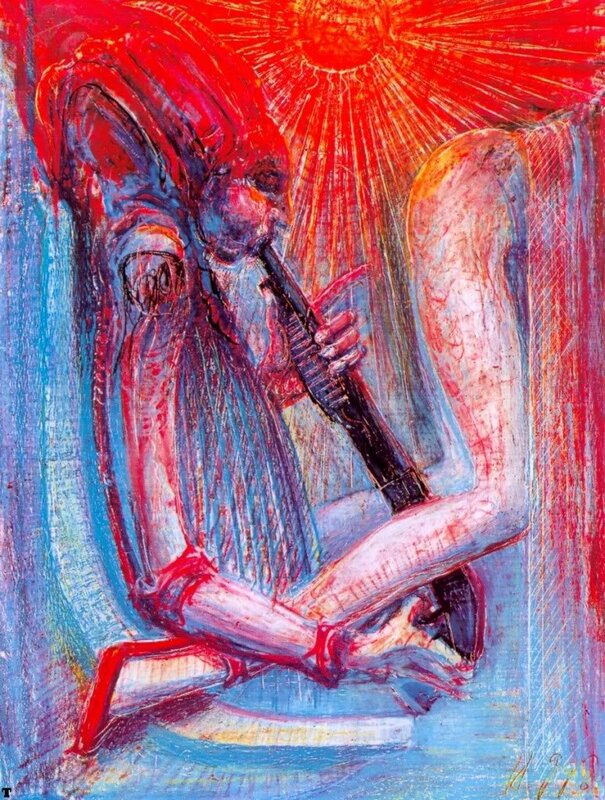 J Karli: So in this image of the Fool the shotgun is a flute, so it becomes a musical instrument. Giger: I used to play a certain wild saxophone. J Karli: What kind do you like? 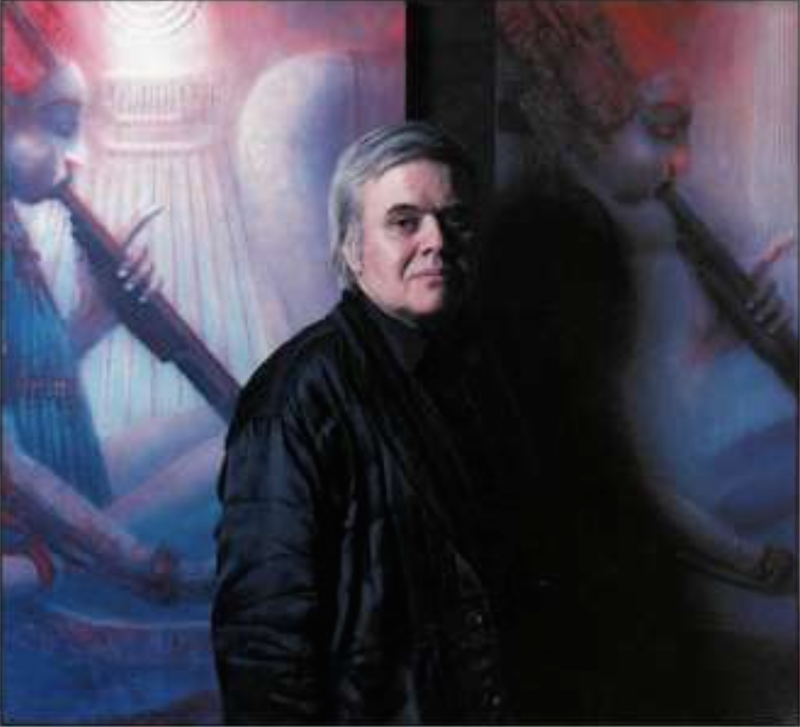 Giger: In earlier days I liked Dixie-Land and then I stayed with John Coltrane. J Karli: Did you like Charlie Parker?